Remember last week’s episode, when Captain Bauer told Jimmy that “The wheel is going to turn”? Well, it appears that it is already beginning to do so. But more on that below. As always, this article is a combination review and synopsis, with information and observations on most of the happenings in tonight’s episode. Read on only if you’re prepared for spoilers! The main story revolves around Mike for about half of the action, and Jimmy for the other half, the two briefly overlapping when Mike brings Jimmy in to help him with a little matter. But first, we open on Chuck at home, sometime after dark. He checks his locks and starts turning down the lamps. In his dining room, a large man sits playing solitaire (we later find out his name is David – he’s a Private Investigator). Chuck asks him to turn the lantern off, and continues staring out the windows into the night. What could he be up to? Mike continues on his quest to find out who’s been tracking him. He follows the car that switched out his gas cap, and sees two men make a hand-off to a third man, who drives away in a Blazer. He follows this guy, and sees him make three pick-ups (perhaps more) from money drops around the city, and then to – you guessed it – a Los Pollos Hermanos restaurant. He goes inside for a few minutes, and then comes back out, driving away. Mike knows he’s made a drop inside – his radio unit shows him that the transmitter is no longer moving. Jimmy, meanwhile, is busy prettying up the office. He’s replaced the rainbow motif with a stylized W/M for Wexler/McGill, and he and Kim are in the process of hiring a paralegal. Jimmy gloms onto the first candidate, Francesca, formerly of the MVD (Motor Vehicle Division). It’s a wonderful little piece of contrasts: Kim serious in her business suit, asking questions, and Jimmy in a rocking chair, tie loose, answering for Francesca and undermining Kim at every turn. He asks the woman if she can start today, and Kim ushers her out so she can speak with Jimmy – turns out he has an ad about to run, and really wants someone on the phones in time. Kim agrees to give her a try. The second call she fields is from Mike – he needs Jimmy’s help. 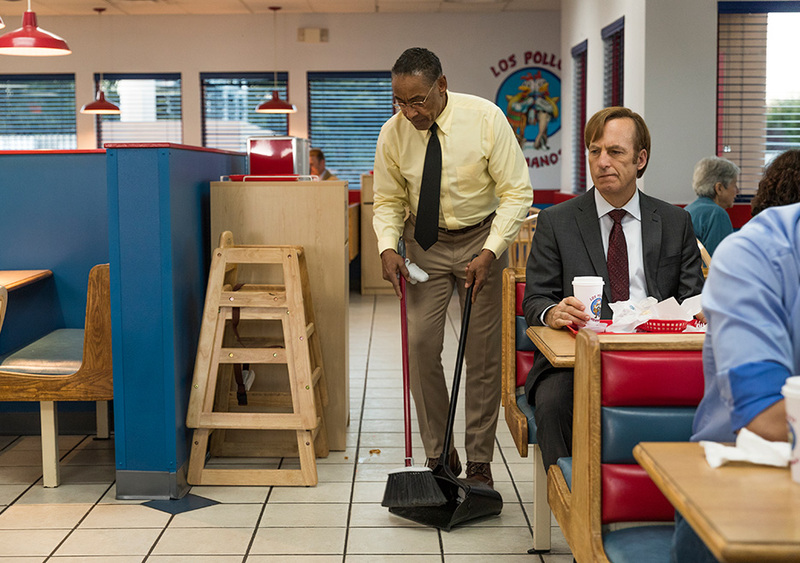 The next morning, he sends Jimmy into Los Pollos Hermanos to see if he can observe who the drop is made to. I just have to say that Jimmy is about as good at stealthy observation as you’d expect him to be. When he sees the man from the Blazer come in carrying his satchel, Jimmy edges clumsily over to the coffee prep stand, looking sideways at the guy the whole time as he puts pack after pack of sugar into his coffee. Then, he loudly changes tables so he can watch the guy directly, and never touches his food. While he’s watching, we see an out-of-focus figure appear behind Jimmy, wearing a yellow shirt and sweeping the floor. Finally, Gus has made his appearance. He sweeps right past Jimmy, goes to the table with the Blazer man, and then keeps right on sweeping. Moments later, the man stands up, deposits his garbage in a receptacle, and walks out still carrying his satchel, no apparent drop having been made. Jimmy practically climbs into the garbage bin, and when gently confronted by Fring, claims to have lost his watch inside. Gus’s first words in Better Call Saul? “Can I help you?” This urbane approach totally disarms Jimmy. He has no clue who he’s standing beside, or the fact that Gus was onto him from the beginning. Gus gets the watch out of the bin for him, and offers to clean it, but Jimmy demurs. He gives Mike a full accounting, and as he drives away, we see Gus sweeping outside. He does not look amused. Later, Mike’s still sitting observing the restaurant from a distance, writing down makes, models, and tags, when a black Escalade goes tearing into the parking lot, parks around back for a few moments, and then tears out once more. 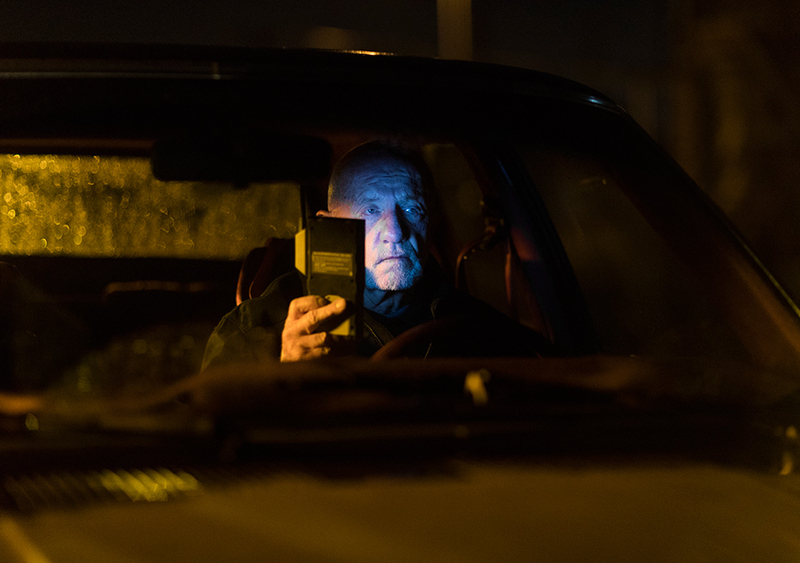 As the car leaves the parking lot, the window rolls down – it’s Victor, Fring’s tough and Walter White’s sometime watcher from Breaking Bad. Mike glances at the radio receiver, and sees that the transmitter is on the move again – he follows. Back at the offices of Wexler McGill, Ernesto shows up outside. He hesitates at the door, returns to his car, and calls Kim. Once she’s outside, he reluctantly tells her what he heard at Chuck’s. Kim goes back in, and tells Jimmy to give her a dollar – he gives her $20, and she says, “Good, now I’m your lawyer.” She fills him in, and we see Jimmy’s face crumble. He can’t believe his brother would betray him in this way (although he’s ignoring the fact that he has also betrayed his brother, setting this situation up in the first place). He spends the rest of the day helping clients with their wills, while Kim does research on the legalities around taped confessions. 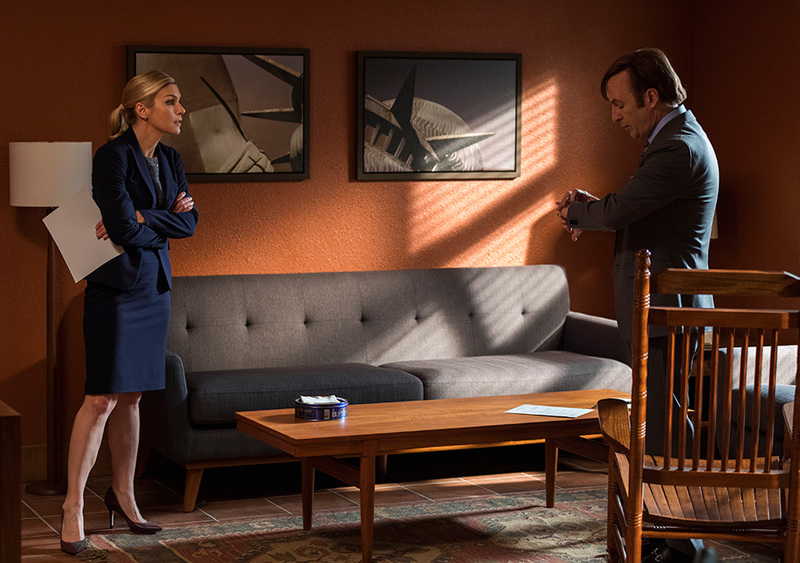 She advises him to hold on any action, as they need to see what Chuck intends to do with the tape – but of course, Jimmy is not interested in waiting for anything. Back with Mike, he comes to a lonely stretch of desert highway (is there any other kind? ), and rolls to a stop when he realizes that the signal is no longer moving. He rolls up, and finds the gas cap on the middle of the road, a ringing cell-phone on top of it. He picks it up – he realizes they’re on to him. “Yeah?” he says. I get the feeling that this is the beginning of a beautiful relationship. At Chuck’s, Howard comes to visit him. He parks a couple of blocks over and climbs through peoples’ backyards to climb the fence into Chuck’s property. Once inside, he tells Chuck that the round-the-clock private eyes they’ve hired to stay at his house are getting a little bit pricy; Chuck asks if they can maintain them at night, as that’s the most likely time that Jimmy will choose to break in. What? So yes, it was pretty obvious that Chuck had set up Ernesto to hear the piece of Jimmy’s confession last week, and here we have confirmation. 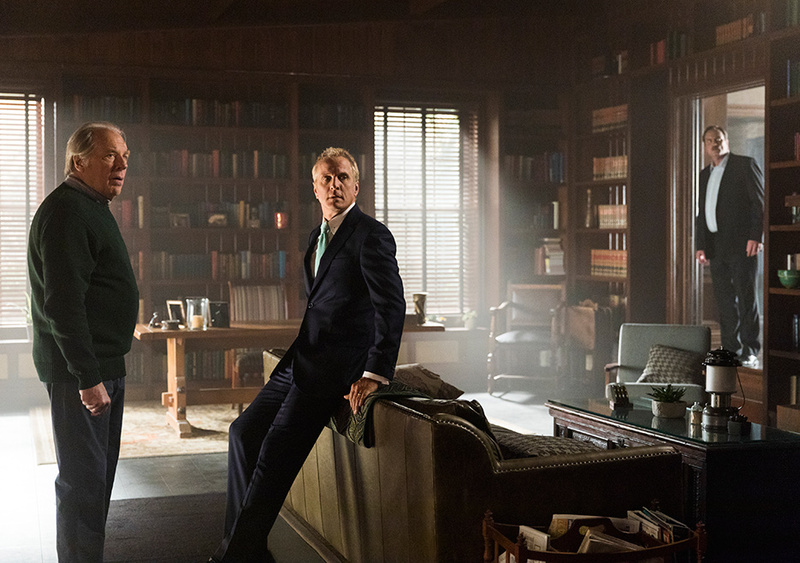 He knows that Ernesto will have to go and let Jimmy know somehow, which in turn Chuck is hoping will force Jimmy to break into his house – this will give him solid grounds for getting Jimmy disbarred, especially if he has a third party (the PI) there as a witness. 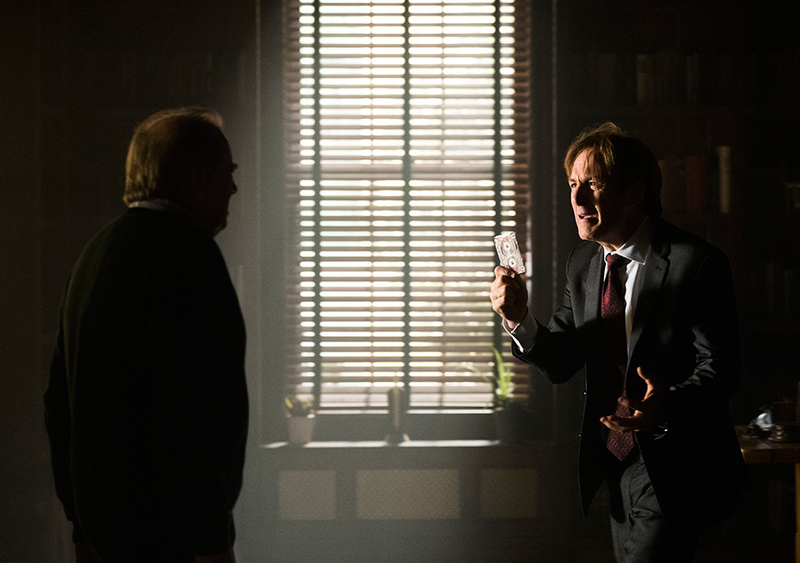 But before Howard and David can leave, there’s a thumping at the door – Jimmy’s come to confront his brother. Chuck won’t let him in, so Jimmy kicks in the door. Chuck backs off, while Jimmy goes to the desk, pries open the drawer with a fire poker, and then tears apart the tape in Chuck’s face. “You’d tear apart our family for this?” he screams, and then Howard and David come around the corner from the kitchen. “Did you witness what just happened?” Chuck asks, and both men say they have. Cut to black with one last shot of completely deflated Jimmy hanging his head – he knows that Chuck really has him now. This week’s episode had much more going on than last, although we’re still left with cliffhangers – at least they’re new ones rather than carryovers from last season. Mike is suddenly aware of how badly he’s been outmaneuvered (although to be fair, that’s really on Jimmy and his atrocious surveillance techniques). And so too has Jimmy. Chuck is brilliant, and he’s moved Jimmy like a pawn on the board, from taking over his big case last season, to eliciting Jimmy’s confession in the season finale, to enticing Jimmy to break into his house and basically threaten him in front of witnesses. The McGill family tragedy has layers upon layers, and more acts yet to play out. 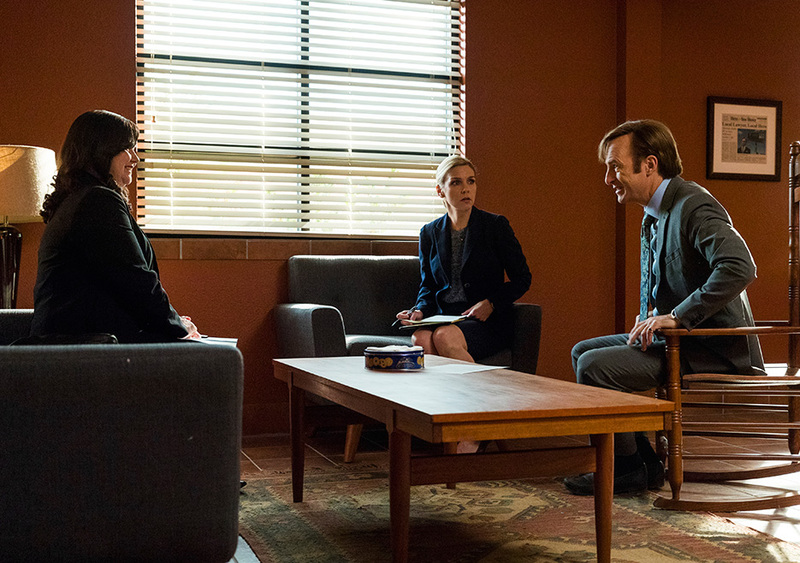 While it does look bad for Jimmy right now, we know of course that he ends up practicing law in Albuquerque for many years as Saul Goodman. What exactly is Chuck’s game here? I doubt that Jimmy is going to get disbarred, due to our foreknowledge, but the fact that he’s using a different name in the future speaks volumes. It’ll be very interesting to see where things head from here. 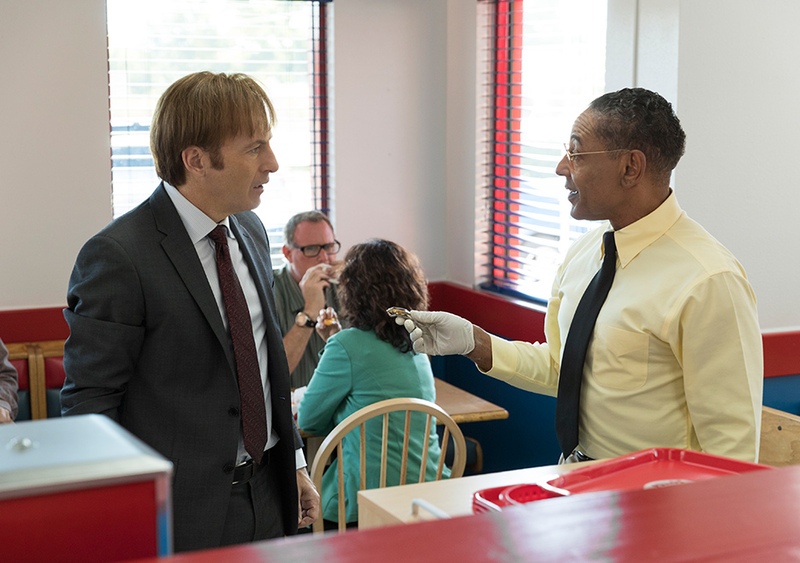 It was great to see Giancarlo Esposito reprise his role as Fring – this is something fans have been awaiting eagerly for some time. His understated appearance, sweeping the floor in the background, is vintage Gilligan, and a great way to slowly unearth his menace. The look on his face as Jimmy drives away is pure Fring. It’ll be interesting to find out just how much Jimmy becomes his creature as the McGill boys face off in the rest of the season. The fact that we never hear of HHM in Breaking Bad is also pretty telling. Overall, an excellent second episode that really gets the ball rolling on this season – I’m looking forward to seeing where they take us over the next eight weeks.